Each time inter-league games are played in Major League Baseball, a quirk in the schedule takes place. With 16 teams in the National League and just 14 in The American League, two N.L. Clubs must match up and play each other while the 28 remaining teams take on inter-league rivals. Since the NL Central has six teams, that usually means two or three teams from Chicago, Cincinnati, Houston, Milwaukee, Pittsburgh or St.Louis take on other National League rivals while playing one less American League Series over the course of the season. The 2011 Major League Baseball Schedule was unveiled yesterday and Our Washington Nationals have been chosen to play one less American League series next season and, instead, take on The Pittsburgh Pirates at Nationals Park twice. But that's not the only oddity shown in the release. Since baseball returned to the nation's capital in 2005, D.C.'s Team has played inter-league ball on a rotating basis with opposing A.L. Divisions. The A.L. West was first up in 2005, then came the A.L. East in 2006 and A.L. Central in 2007. With some slight changes, that inter-league rotation has remained in tact to this day. But in 2011, much of that has changed. Washington will again take on their "natural rival"--The Baltimore Orioles--in home and away match ups. The Battle Of The Beltways will return in May and June next year. But D.C.'s Team will only play The Seattle Mariners at Nationals Park & The Los Angeles Angels of Anaheim at Angels Field from the A.L. West. For some reason, MLB has decided to put The Chicago White Sox back on Washington's schedule--this time at U.S. Cellular Field. Combining that unexpected match up with an extra N.L. series against The Pirates and Our Washington Nationals will not play The Texas Rangers or The Oakland Athletics of the American League West Division in inter-league play in 2011. Interestingly, The A's & Nats have only matched up one time previously and that was in 2005--when Washington began their 10-game win streak that catapulted the team into first place in the National League East. One final twist to the 2011 Schedule. Beginning on September 12th, Washington will head off for a four game road trip to Citi Field in New York. They will immediately return to Nationals Park for a three-game set with The Florida Marlins, take an day off, and then travel to Philadelphia for a three game series with The Phillies. Turn right back around and come back to D.C. and take on The Atlanta Braves for the final homestand of the year and finish the season on the road at Florida--playing the final regularly scheduled game to be played at South Florida's "Whatever They Want To Call It Stadium". So to repeat: Beginning September 12th and running through September 28th, 2011: Four games away, three games home, off day, three games away, three games home and finally--three games on the road. Sort of strange, but clearly manageable considering the distances. Washington will play at home for all three major U.S. Holidays--Memorial Day against The Phillies, July 4th versus The Cubs and Labor Day (September 5th) with The Dodgers. Our Washington Nationals will also play at home on September 11th, 2011 against The Houston Astros. The 10-Year Anniversary of one of this country's darkest days. Once the 2011 season is completed, Washington will have played baseball in all but three venues: Oakland-Alameda County Coliseum in Oakland, Kauffman Stadium in Kansas City and Target Field in Minneapolis (although Washington did play at The Twins' former home--The Metrodome). 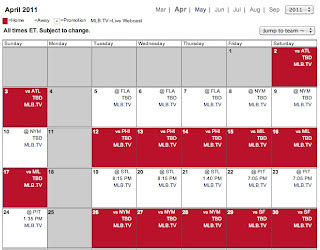 And finally, in order to move up the post-season beginning in 2011 and avoid the possibility of World Series Games being played in November, Major League Baseball will begin the season on Thursday, March 31st and Our Washington Nationals will be playing at home that day against The Atlanta Braves (start time to be determined). Two comments---for obvious reasons it's good to see that our opponent on Opening Day next year will NOT be the Phillies. Even if the park is not sold out that day, it will be already be much more pleasant than Opening Day 2010. Second, I can't help but wonder if baseball decided to let the Nats play the White Sox again in 2011 because of one fan in particular living at 1600 Pennsylvania Avenue? Maybe they're already planning for Obama to attend that series in Chicago? Eddie: Anything's possible, but it's improbable or any organization, not just MLB, to hold a meeting or event hoping The President of The United States might attend. Too many other factors go into any personal or private appearance by a sitting President. There is really no way to tell this far in advance. The September schedule may be without precedent in that we play at home all four weekends. Whoa, not playing the Phillies on opening day. That's different. 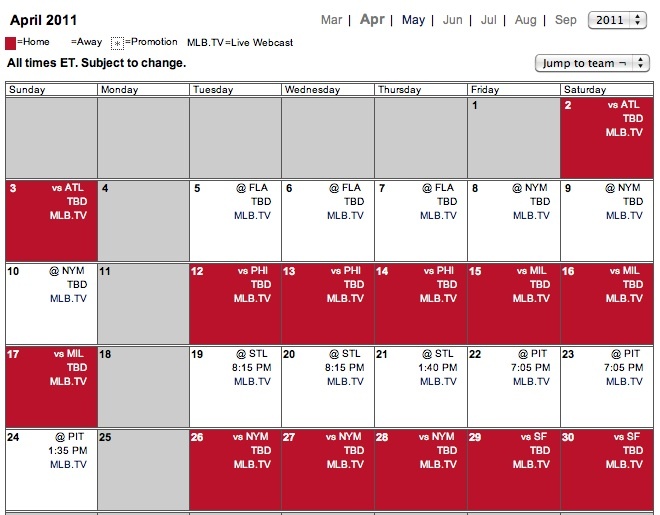 The September Schedule is quite remarkable and pretty daring for MLB when it comes to The Nationals. It's conceivable that Stephen Strasburg might be back pitching at that point and Nationals Park could be packed for his performances on quite a few of those nights. (It's conceivable that Stephen Strasburg might be back pitching at that point and Nationals Park could be packed for his performances on quite a few of those nights. As much as I would love see Strasburg pitch again in 2011, I hope the Nats do not rush his recovery from Tommy John surgery just to pack the ballpark for meaningless games in September. (Hope I'm wrong and that they do mean something.) I can wait until 2012 if need be.